Almost six decades of tradition and unprecedented hospitality have not only made Villa Dubrovnik one of the most recognizable hotels in Croatia, but also the most romantic and serene, perfect for a peaceful seaside getaway with your loved one. Located on the cliffs above the most beautiful part of the city of Dubrovnik, Villa Dubrovnik has always been the favorite destination to all those who were seeking privacy, luxury, and that special touch of elegance on a romantic getaway. At Villa Dubrovnik, each one of our fifty-six luxury residence units are enriched with the stunning view of the island of Lokrum and the Old City walls and specially designed for your comfort, privacy and relaxation. The suites introduce a new meaning of luxury and provide you with even higher levels of comfort, giving you everything you could ask from our hotel but with greater space and on a greater scale. If you seek maximum comfort and privacy, we will welcome you at Villa Kolin, a separate villa located in the gardens of Villa Dubrovnik, with its own services, entrances, and facilities. Villa Dubrovnik's private beach is at your full disposal during your stay. Enrich your day with spectacular swimming in the turquoise waters beyond our centennially pines or just relax with your favorite book in shaded sunbeds. Spend the whole day on sunbeds in front of the sea - footsteps away from pristine seawater! For additional pleasure find your perfect spot around our indoor/outdoor swimming pool, open daily and during all seasons. Hide from the sun in gazebos with your cocktail and favorite internet-device using all benefits of Wi-Fi network, or relax under the sunlight for the final touch on your perfect tan. Located on the third floor in the very heart of Villa Dubrovnik, Villa Spa allows you to delight your senses and soothe your soul with innovative body treatments alongside classical enjoyment in saunas (Bio Sauna* and Steam Room) and massages. Villa Spa is proud and certified Sodashi™ partner. Go into relaxation mode. Relax in the idyllic setting of Restaurant Pjerin located on the cliffs above, overlooking the sea with an unrivaled view of the Old City and indulge your senses being broadened by the flavors and aromas. Walking distance away from Dubrovnik Old City, Villa Dubrovnik offers worldwide awarded hospitality, embodied through refined elegance, as one of the best hotels in Croatia. 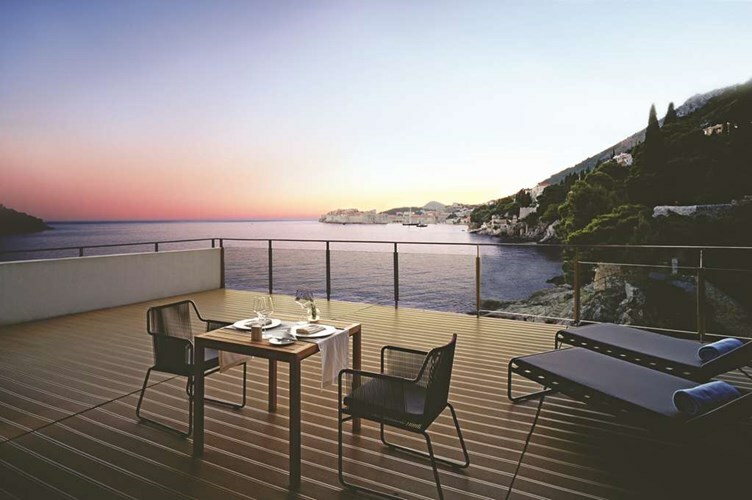 Fifty-six luxurious sea-view residences welcome you with unprecedented comfort and service. Soothe yourself with personalized treatments at the Villa Spa and discover the excitement of vaporetto speedboat trips to the Old City. Alfresco bistro Giardino will shelter you from the sun while tasting fresco-menus after a swim on the secluded beach. The stunning vistas of Dubrovnik from the rooftop Prosiutto & Wine Bar embody Villa Dubrovnik, making it simply unforgettable. Let us design your perfect romantic getaway to Croatia! 604-736-7447 or select the 'contact us' button to send us a message!